My last post, Beware the Nearly Useless Low-End Android Tablet, was about my efforts to find a low-cost Android tablet that was worth buying. 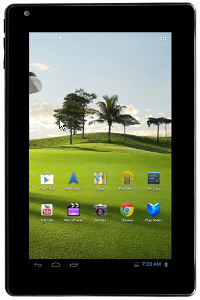 I mentioned that I was ordering a $69 Nextbook 7″ Tablet with 8GB Memory from Walmart. I’ve now been playing with it for a few days, and I like it. The main reason I chose this tablet is that it explicitly said it had Google Play preloaded. And it did. Last week I noted that some bottom-of-the-line tablets only had dorky, semi-useless proprietary app stores, not Google’s huge one — which many people (including me) consider the best thing about Android. As people who own Android phones or tablets have learned, not every one of the hundreds of thousands of Android apps work on every Android phone. So far, though, I’ve only found a few that wouldn’t install and run on my Nextbook, and there were enough other, similar apps that I didn’t care. I also have Wondershare MobileGo on my PC because it is the best program I’ve found for connecting/syncing Android devices and computers. Even programs (ASC is an example) that don’t recognize my Nextbook when it is USB-connected to my computer work after you run MobileGo. It costs $39.95, but if you review software and devices, as I do, it’s a tiny investment. Otherwise, you probably don’t need it. If you are an IT professional or serious tinkerer or need to use software (many screencast programs, for example) that only run on rooted Android devices, the Nextscreen is not locked, so it can be rooted easily. (But then, my HTC 4G phone is “locked,” but HTC makes it easy to unlock.) I have not rooted mine, but I am not you. Once rooted, of course, your Nextbook will run almost any Android app. My original reason for testing low-end Android tablets was that my assorted grandchildren love tablet computers, but are good enough at tablet-breaking that buying them $300 SammySings or $500 iFads is a waste. Naturally, as often happens in this situation I decided to keep the test unit for myself as a combination book-reader and (with earbuds; its speakers are lousy) music & movie player. I can now go to the beach and carry 20 books, 10 record albums (got the Beatles White Album playing right now) and a couple of movies. And, if I’m feeling masochistic, I can type out stories on the tiny virtual keyboard. Although I kept the “test” Nextscreen for myself, I just bought another one as a gift for a relative who has a birthday coming up. She has a long bus ride to and from work, and is a heavy reader, so I think she’ll enjoy it. I installed appropriate software (including what her local library uses) for her. I hope she likes it. And if she does, I’ll get them for the younger family members, too. While nothing is unbreakable, the Nextscreen seems to be made of rather sturdy plastic and the touchscreen seems like it resists scratches rather well, so I’m willing to chance giving it to children as a combination play and homework (with a case/keyboard included) machine. 1) If you want more storage for books, music, and movies, this unit takes standard SD micro memory cards. My local BestBuy has these $29.95, 32 GB SD micro cards in stock if I need them right away (or need that big a card), but if I check Amazon, NewEgg, and other online retailers, and keep an eye open for sales, I’m sure I can do better. Great post! How about battery life? My wife is hounding me for a tablet now that she sees me making my Xoom hum along. If this little tablet gets Android 4.2 every user can have their own home screens, apps and wallpapers too. It could become the perfect little companion for families on a budget. Ah - you can disregard my follow-up comment on your last posting - I was curious to see how this worked out for you. Glad to see Nextbook has done something to improve their tablets - their early ones were horrible. Good to know they've improved instead of closing their doors! https://itknowledgeexchange.techtarget.com/cheap-computing/a-69-android-tablet-thats-worth-buying/ - next colog entry - bought it, liked it, got a little case/keyboard for it I'll write about later. Keep reading!